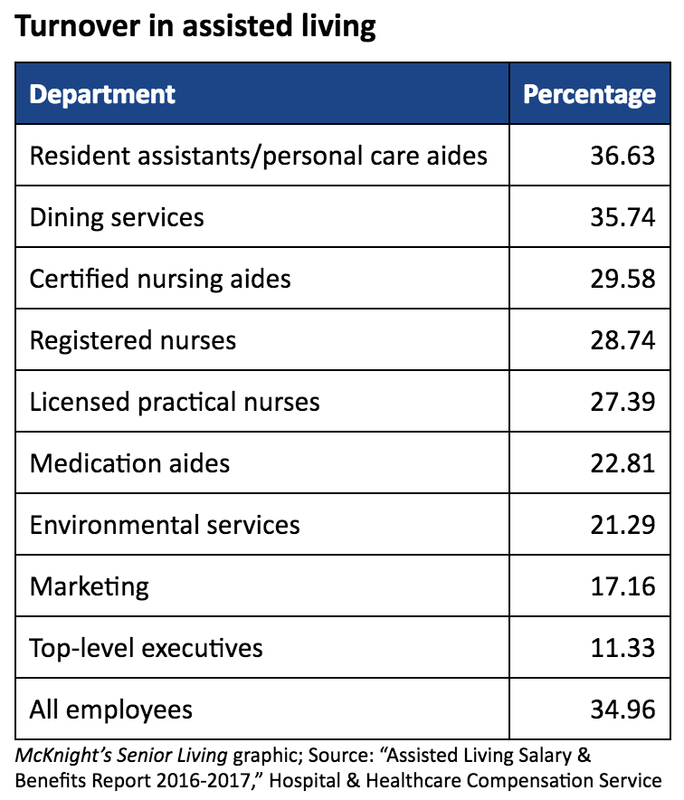 Assisted living communities saw the highest turnover among resident assistants/personal care aides in 2016, according to the 19th annual “Assisted Living Salary & Benefits Report,” released Jan. 23 by Hospital & Healthcare Compensation Service. The annual turnover rate for such workers was 36.63%. The report defines RAs/PCAs as those who perform “various resident care activities and related nonprofessional services essential to caring for personal needs and comfort of residents.” The category includes universal workers but not certified nursing aides. The department with the next-highest turnover rate in assisted living was dining services, where the rate was 35.74% in 2016, according to the report. Turnover was lowest among top-level executives, where the rate was 11.33%. Overall, the majority (57%) of respondents said that the turnover rate had stayed the same over the past 12 months before they took the survey. Twenty-eight percent said it had increased, and 15% said it had decreased. This year’s report contains data from more than 1,300 assisted living communities, according to Katie Smith Sloan, president and CEO of LeadingAge, which cooperated in the production of the report. The question about turnover received 601 responses. The National Center for Assisted Living also supported the research. The report is available for purchase for $350.